I read this article and found it very interesting, thought it might be something for you. 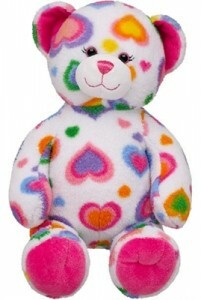 The article is called Build-A Bear Recall: 'Colorful Hearts' eyes pose choking hazard and is located at http://www.imperfectparent.com/topics/2011/12/29/build-a-bear-recall-colorful-hearts-eyes-pose-choking-hazard/. Just before Christmas the Consumer Product Safety Commission along with Build-A-Bear, announced they were recalling over a quarter million stuffed animals. The affected ‘Colorful Hearts’ bears were sold beginning in April of 2011 through December in the United States and Canada. The stuffed animal is about 16 inches high with black plastic eyes. The bear’s fabric covering is printed with multi-colored heart shapes and was sold by Build-A-Bear Workshops nationwide and online at www.buildabear.com for about $18 in the U.S. and $23 in Canada. In lieu of a refund, Build-A-Bear is offering a coupon for “any available animal of your choice” in exchange for the defective bears. The recalled teddy bears were manufactured in China at the Dongguan Soyea Toys Company and the Shanghai Yuanchen Oubei Toys Company Ltd. According to Watch China Times, ‘The China Economic Weekly in Beijing reported that Dongguan Soyea toy company was the world’s second largest toy manufacturer”, with more than 30 million in yearly profits. Chinese news site news.xinhuanet.com, says the company was once a supplier for Target.